First off, I would like t osay that Mario, you rock! I was sitting here trying to think how I would render some hair when I found an old post of yours where you helped someone render their ri_curve as a tube. image1 : default hair shader. image2 Mario's tube shader. Do you mind if I package it up and put it on the codex? As an improved hair shader? oh P.S. If anyone has any idea on where to start for a skin/fur shader for this guy, I'd be mighty appreciative. just make sure it is antialiased correctly. At the risk of endangering someone's life at the hands of a large utility vehicle... can you at least say whether it was a siggraph paper or not, and whether it was relating to hair/fur, or to the skin part of the question? Nice interesting papers. It's time like these that I wish I understood more than just the pretty pictures . Perhaps it shouldn't go up just yet . I was just so excited yesterday that I actually got something better than the default hair shader. That shader doesn't even try to antialias the illumination. Instead, it fades the parametric surface coordinate s to the center position (in this case zero) as the ratio of the curve-width to the filter-size shrinks. Yikes... straight from the "l33t h@x0r sh4d1n9 mAnUa1", chapter 666. Anyway. There's also a lot of extraneous (read unnecessary) stuff in there that had to do with showing how to derive a height for displacement. The actual guts of computing the normal is just two lines of code (which I had also posted to the wiki here). I threw together a quick VOP that you can use to produce this (mysteriously antialiased ) normal, so you can then feed it to whatever lighting model you care to invent for your hair (OrenNayar or whatever). the was a sketch this year about using a density lookup for hair. seems interesting. I found this oldish link as well for you and yours. I like the paper you pointed out as well. Thanks Mario, this one works nicely.. pretty simple too . @kenny : I'd dug up that paper already, its pretty cool. A lot of the stuff may be a little on the overkill side for what I'm trying to achieve though . But definitely a nice guide on what to look out for. Besides, I never think of horses as fluffy.. They're more sleek and shiny, so I may get away with texture mapping combined with a nice shader for the specular and whatnot. Thanks for the paper references, Kenny and Edward! And the problem is that it can look really "burned out" because it makes no distinction between front and back lighting. Actually... I got curious so I just checked the code for the "VEX Hair" shader that ships with Houdini and it is exactly the model I just described! So there you go... if you use the vex hair shader, you're using the Kajiya model. There are ways to take directionality into account and attenuate contributions opposite the viewing direction. 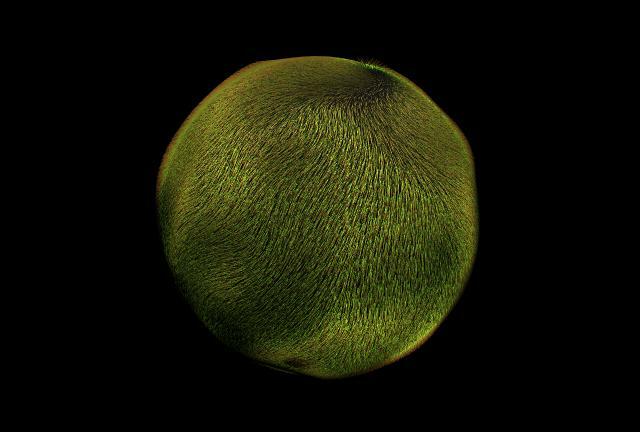 Plus you can warp T along +-N to emulate the two separate specular hits that real hair has (due to the fact that it's made up of layered cones, not a simple tube). When I get some time, I'll try to post a version of this. I forget now but I recall someone just this past siggraph saying that the sign had to be reversed from the Kajiya paper. Perhaps the paper mentioned in the VEX Hair shader explains why. 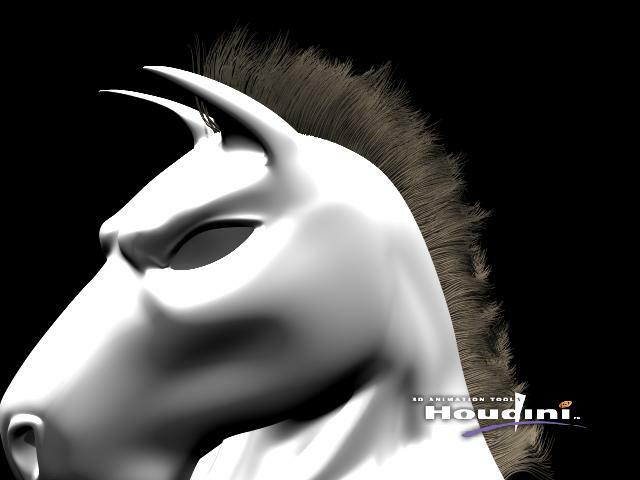 My point wasn't the fact of using the Kajiya model but rather to do a volumetric approach for the fine horse fur rather than using actual geometry. Yes, I agree. For millions of very short hairs, something like that would be the way to go. I was just trying to give Marc a version of the model that he could apply "right now"... only to then realize that the model is already available in the hair shop ... oh well. There's also a statistical (as opposed to volumetric) method that was used for 101 Dalmatians... siggraph circa ?... can't remember... I'll try to look around for it. A statistical approach may be easier on the implementation side, than the volume thing -- (but only applicable for *very* short hairs, of course). I found a straight anisotropic highlight over an oren-nayer type of diffuse contribution to be just as effective as the statistical approach for representing short, dense hair (cow, dalmation, etc.) with far less headaches, but that's just me. I found a straight anisotropic highlight over an oren-nayer type of diffuse contribution to be just as effective as the statistical approach for representing short, dense hair. That's good to know. Thanks for the insight! Yeah, I don't know how many times I've knocked out a simple solution in 15 minutes and spent days noodling it only to go back to what I had in the first place. Let's pretend that I've decided to instance a ton of hairs onto my horse. Shouldn't be too bad since all you see of his skin/fur is the head and arms. So, thinking that I would like to be alarmingly clever about the whole deal, I'd like to paint a texturemap and have the hairs pick up the colours of the texture, that way I have an easy method of getting nice colour variation across the surface of the horse. 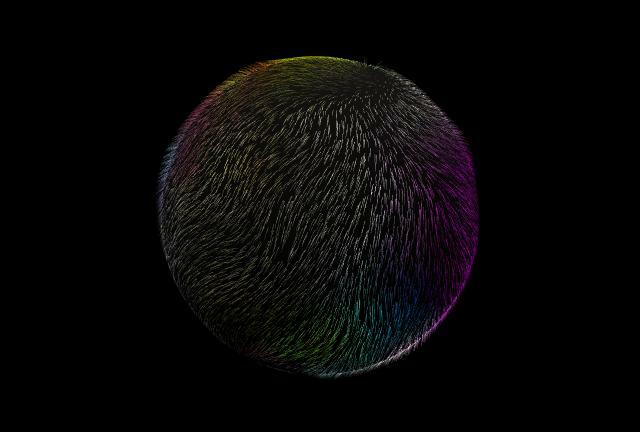 My current theory now is to assign the relevant uv's to each hair point and use a texture call from within the shader to pick up the diff colour at that point. I think this will be a gazillion times faster.. assuming it works. If anyone has any better ideas then let me know. P.S. The second one is the mandril. Also, have you seen the Sesi demo of the bunny rabbit with fur on it. Looks very nice, it just uses the scatter sop, some combed normals and copies a short line to each point. I'm also guessing they just used the default houdini hair shader. Reading the stuff about how they did the fur for Stuart little I particularly liked the idea of mixing the surface normal with the fur tangent in order to calculate the fur shader lighting model. I like the idea that you can you light the skin as normal and the fur won't change the look too much. Not "physically" correct but very controllable, a nice bodge. Thanks for the link, that's great. Nice tips in there. I think between the Stuart Little paper and that one, I should be able to get some nice fur. I like the shadowing hack in the RnH paper too. Very clever . 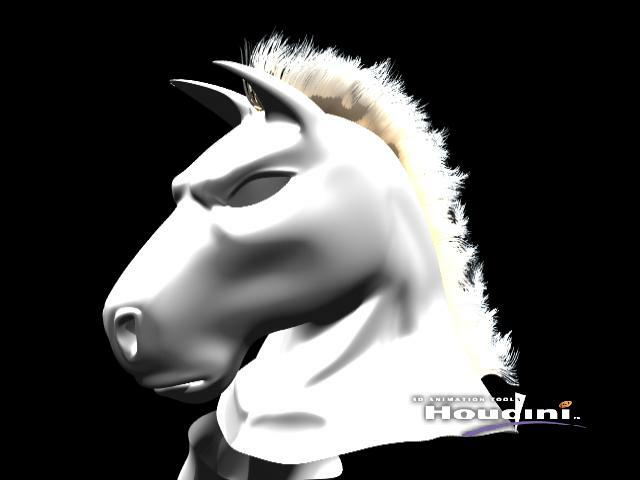 As for the fur, I'm combing the normals and scattering points (which then pick up the normals). Once I get the texture map lookup for hair colour working then I'll try and extend the method to define all the other characteristics I need (a map for length, for instance). Nothing like jumping in the deep end though.